Former U.S. attorney Michael J. Garcia finished his investigation into allegations of bribery in the bidding process for both the 2018 and 2022 World Cups earlier this year, and he has made it known that he would like the report to be made public. 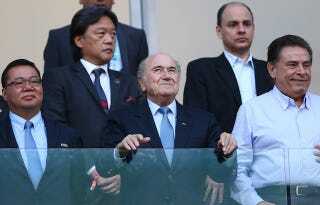 The report is currently being kept secret by Hans-Joachim Eckert, a judge and a member of FIFA's ethics committee (ha!) who doesn't seem to have a very strong grasp on how these things are supposed to go. Garcia pointed out repeatedly to Eckert and Sullivan that this was not a criminal investigation but one that related to FIFA's internal rules and regulations. Eckert did not appear to be swayed, however, and that disagreement was the beginning of an awkward, indirect back-and-forth over the past two months regarding the viability of releasing Garcia's report. "In some aspects Eckert is too much focused on criminal law and not the ethical aspects of the cases," [German attorney Sylvia] Schenk said. "They are totally different situations. In a criminal court, there are rules about what can be said and what can be revealed — in an ethics commission, as far as I understand it, it is more important to look at the people and explain why they should act in a certain way." Eckert has previously stated that full publication of the report would not be "legally possible" because of the need to protect the "personal rights" of those mentioned in it. The Times reports that Garcia was "shocked" by this decision during his meeting with Eckert, as he believed a few redactions of key witnesses would do the job and make the report perfectly fit to release publicly. For whatever reason (though I think we all have a pretty good idea), Eckert disagrees. Eckert does plan on releasing a synopsis of Garcia's report later this month, though nobody knows how expansive this synopsis will be.